Although Eline was born and raised in The Netherlands, she has spent numerous years abroad, studying and living especially in New York. Now an international award-winning artist, she got the initial inspiration for her series of shadow paintings from traveling the dynamic cities of the world. Her fascination and passion for New York started being a student in the late 80’s, in the city that was going through a transition. On her Dutch bike she observed the dynamics of the people and was intrigued by the ever-changing neighborhoods. De Jonge was often caught up in the energy and the positive mindset of the New Yorkers. The effect of bright days in most seasons (even winter) resulting in dramatic shadows, became an important element in her work. The shadows of the people in motion adds more drama to their movement. Adding a focal point of height and distance became another important factor in her compositions which enabled her to be an observer. These starting points resulted in a series of paintings depicting scenes such as Grand Central Terminal, street scenes with moving taxicabs, the ice skaters in Central Park and city-scapes. Since De Jonge has been living in Europe again, her favorite European city of Paris has been added to her portfolio. Apart from using oil on large canvasses, De Jonge uses a great variety of materials that always has to relate to the subject of her compositions. She developed a Winter series of paintings on wooden panel of ice skaters and skiers, finished with a glossy layer of resin, to enhance the feeling of ice. In a series of mixed media paintings, she uses the New York Times and tells a story with a selection of clippings. Also New York vintage (subway) maps are used as a backdrop for her work. “The Compass of Life” series uses marine maps from the area of New York. The compass is used as a metaphor for our search of direction and purpose in life. In her work De Jonge is looking for a balance between energy and contemplation, between movement and quietness. Although the paintings depict dynamic city scenes, they often convey a remarkable sense of calmness. This tension is what is unique in De Jonge’s work. Elline works in an antique studio in the middle of rural Blaricum, just 20 minutes outside Amsterdam, which is in great contrast with the city scenes she paints. The studio is from the Dooyewaard foundation that selects artists to live and work there. 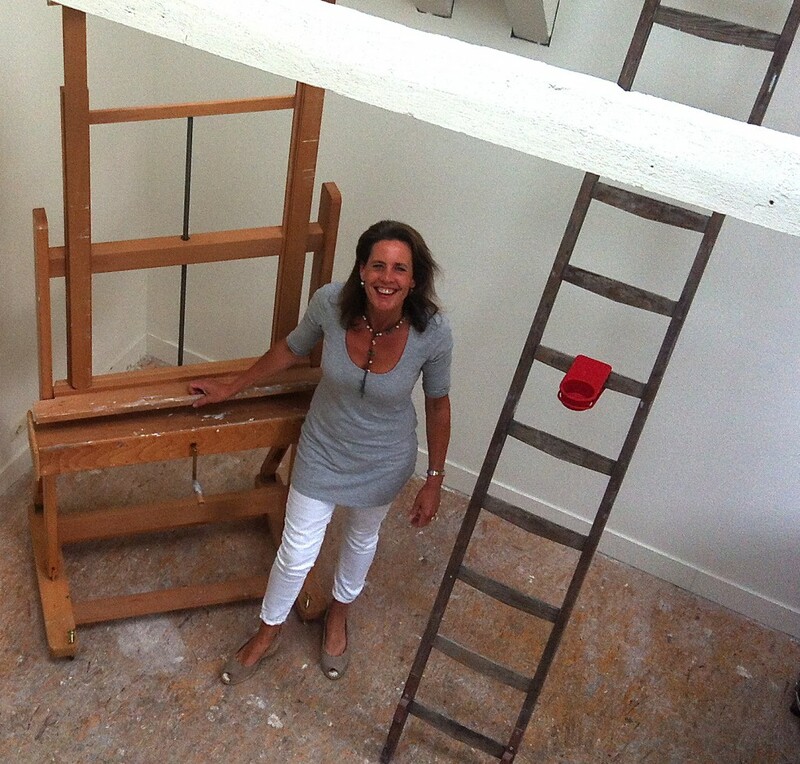 Recently the studio’s, that includes Piet Mondriaan’s studio, where completely restored. Eline’s studio has now a large basement with exhibition space, flooded with daylight in addition to the original upstairs workspace and large artist window with northern exposure. Eline’s art education was mainly attained at the School of Fine Arts in Utrecht (H.K.U. 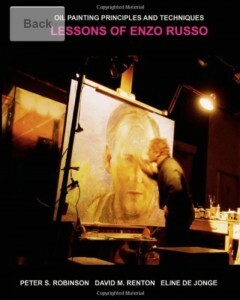 ), at the art history curriculum at Trinity College in Cambridge (U.K.) and with her mentor Enzo Russo, a pupil of Georgio de Chirico. Eline also developed and taught an art curriculum for children “Paint-a-masterpiece” and co-wrote an artbook, “Oil painting principles and techniques: lessons of Enzo Russo”. Eline works exclusively with 4 galleries in New York, London, Barcelona and the Netherlands where she exhibits her work at shows and prestigious artfairs as PAN Amsterdam, Art Miami Context, Scope Basel, Art Southhamptons etc. Her successful paintings have led to numerous commissions from private clients in he United States and Europe as well as for public and corporate buildings like the Amsterdam Courthouse and Four Season hotels. “Unlike most representational artists of the current decade, Eline de Jonge does not begin her own creative voyages from a particular visual prerequisite. Rather, she moves exactly in the opposite direction. Eline de Jonge begins with one clear-cut concept, that she may find visually stimulating. Then, following her questing nature, she seeks a way to express that concept through the vocabulary of her chosen medium. “Eline de Jonge kan goed kijken. Ze neemt plaats, ergens in een van haar favoriete wereldsteden en vervolgens observeert ze het leven van alledag. Mensen die zenuwachtig heen en weer rennen, die een trein willen halen, die schaatsen, zaken doen, praten, slenteren. Of auto’s die om perkjes heen scheuren. Al die bewegingen legt ze vast op doek. Alhoewel, vastleggen is niet het juiste woord. Het worden geen letterlijke “afdrukken”, maar vertalingen. De massa’s in de stad worden in De Jonge’s brein een soort schaduwen van bewegingen.